Driving to the South Bay for a walk along the beach to escape the heat, I was invited to experience the new chef, Matt Strong, at Jackson’s Food + Drink on Rosecrans. 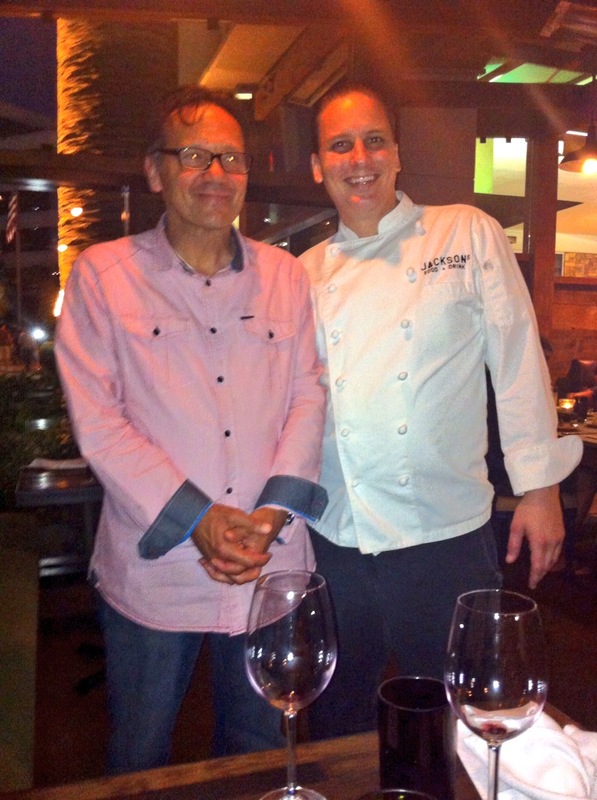 Owned and managed by chef and restaurateur, Scott Cooper, the restaurant is named after his son. Cooper, a self-taught chef, appreciated Strong’s culinary background and work ethics during the interview and hired him on the spot. I sat down at a long wood table near a wood-burning fireplace on the patio for a multi-course dinner with wine pairing. As dishes were delivered, Chefs Strong and Cooper periodically arrived at our table to describe each dish. Strong said his father instilled his passion for cooking as a young boy while they prepared brunch or dinner together almost every Sunday. He left USC before graduating to follow his passion and train at the Culinary Institute of America. “My grandfather encouraged my dad to be an attorney. I think my father would have preferred to be a chef,” he said. After culinary school, Strong worked with Wolfgang Puck, the Patina Group, Jean-Georges, and at Chez Betty in Park City, Utah. All of these experiences taught him to highlight, not hide the true flavors of food, he said. Strong enjoys shopping at the Beverly Hills Cheese Shop and the Santa Monica Farmers Market for the freshest ingredients. Many were used in our multi-course meal. The first course of the evening was a lightly browned cauliflower enhanced with lemon, olive oil, chile, mint and toasted pine nuts. It was paired with a golden Pilsner to open up the flavors of the appetizer. Next, we were presented with corn ravioli stuffed with fresh crab. It glistened while it was poached in butter and stock. The dish was adorned with English peas, melted tomatoes, micro greens and flash fried mushrooms. Cooper paired this dish with a Sonoma Chardonnay. The third course was a miso black cod resting on a ginger buerre blanc and drizzled with a sweet soy sauce. The sauce was not as carmelized as I like, however, the cucumber salad was a nice side dish with the mellow tasting fish. A small pour of French Sauvignon Blanc elevated the dish. 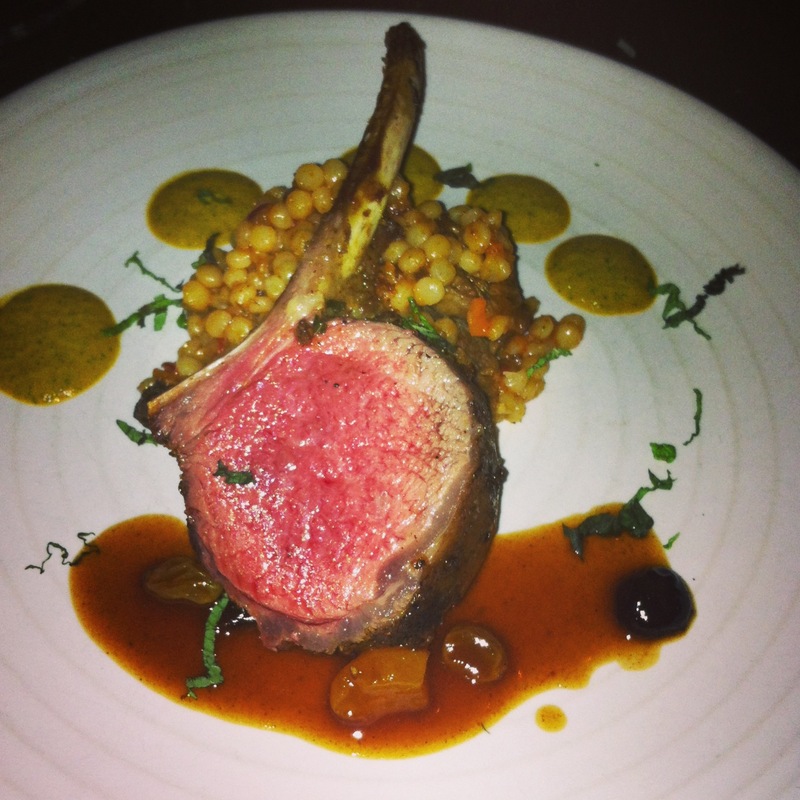 Our final dish was an oven roasted Moroccan flavored lamb chop on a bed on couscous with dried fruit chutney. The Colorado lamb was cooked in lamb stock, and plated with a housemade yellow pepper harissa. Cooper paired the lamb with a Clos du Bois Pinot Noir with deep shades of black cherry and hints of smokiness. Its silky texture integrated the bright fruit flavors and complemented the lamb. For dessert, we finished with a crisp Australian Pavolova with fresh berries, a splash of caramel sauce, white chocolate whipped cream and crème anglaise. Pavlova is a meringue-based dessert named after the Russian ballet dancer Anna Pavlovat. In the 1920s while she toured Australia and New Zealand, the dessert was created in her honor. It’s usually served during the summer time and can be very sweet. This one was not and went nicely with a cup of rich French press coffee. 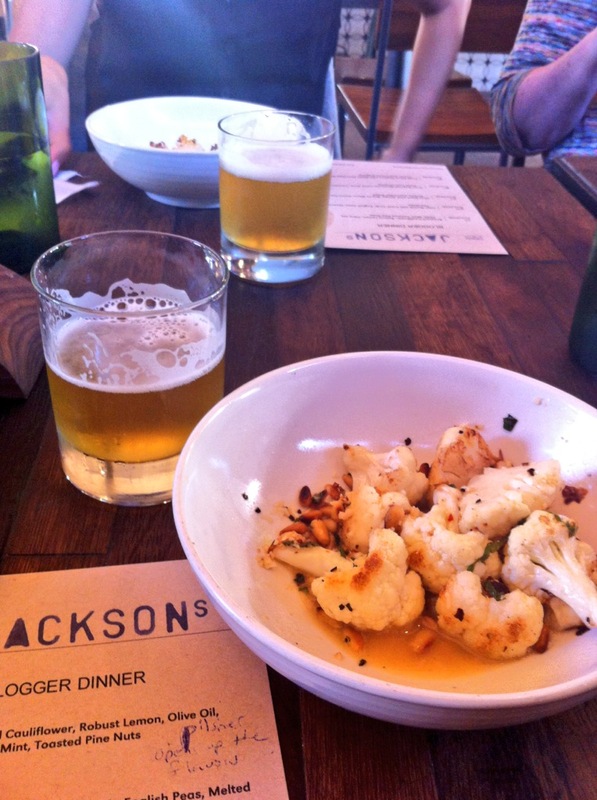 Jackson’s offers an all night happy hour on Mondays from 4 p.m. to closing. On Tuesdays, they serve short rib tacos for $1.50 and Margaritas for $4 from 4 p.m. to closing. Bring your wine on Wednesday for free corkage, or select a bottle from their list under $50 and receive half off. Does not apply to wines by the glass. Open Monday through Thursday from 11 a.m. to 9 p.m. Fridays from 11 a.m. to 11:30 p.m. Jackson’s opens on Saturdays at 4 p.m. to 11:30 p.m. and Sunday from 4 p.m. to 9 p.m. 2041 Rosecrans Ave. (310)606-5500. Published on Aug. 28 in the Beverly Press and Park La Brea News.